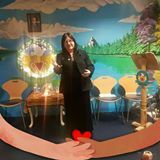 Mona is trained in Hypnosis, Mediumship, Past life regression and Reiki. She is a member of the Spiritual union of Ireland. Trance & Member ICHP & IACT & PHL & NSU & SUI.